Diagnostic Features - Antennae 11-segmented. Palp formula 1,3 or 2,3. Eyes minute. Mandibles narrowly triangular, not overhung by the clypeus. Propodeum and petiole unarmed, the latter is an unarmed scale. Roger's (1862a) genus definition is at . 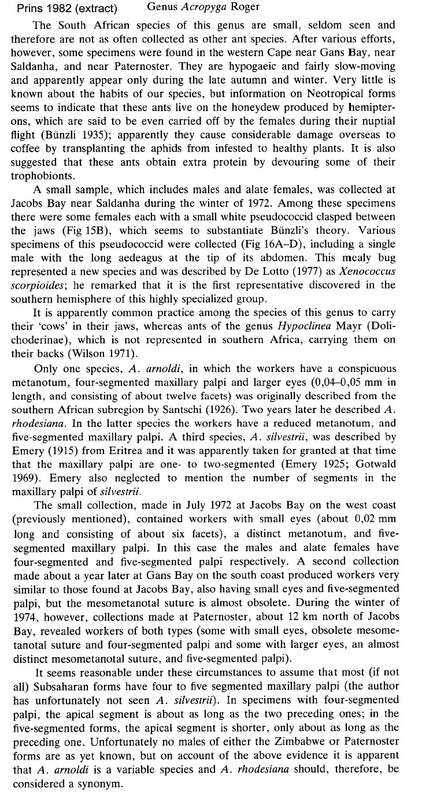 Described by Bolton (1973a) as small, depigmented yellowish ants, which are hypogaeic and uncommon. 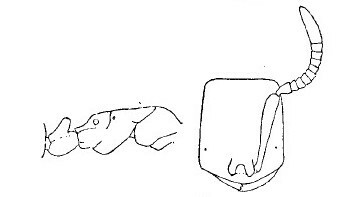 Bolton (1994) had an illustration (bottom). Prins (1982: 237 ff) reviewed the situation in Southern Africa and provided much information and illustrations - see . LaPolla & Fisher (2005) recognised a third species, A. bakwele from Gabon. 1 HW < 0.55 mm; note the specimen from Kenya in the photo has a slightly different head shape to the type drawing . 2 HW < 0.7 mm; TL < 3 mm; head without median ocellus . Found in leaf litter (17 workers) and soil (10 workers) at four sites in Ghana (Sui River Forest Reserve, primary forest; Ofinso, cocoa; Effiduase, cocoa; Bunso, primary forest) by Belshaw & Bolton (1994a, b). As it was unlabelled, the image right (if available) may be of this Ghanaian source but I cannot be certain.